Featuring members Daray (drums, percussion) and Orion (guitar, vocals) of VADER and BEHEMOTH, respectively, Poland's VESANIA is no side project. The duo formed the symphonic black/death metal band in 1997, years before either man joined the ranks of the Polish elite. On "God the Lux", the follow-up to 2003's "Firefrost Arcanum" (Empire Records), Orion and Daray join "keymaster" Siegmar and bassist Heinrich in creating a dark, dense and crushingly heavy album. Combining Polish death battery with lush keyboard orchestration (similar to DIMMU BORGIR) and a general aura that recalls later period EMPEROR, what the album may lack in individual track distinction, the band makes up for in an all-encompassing approach. A fat bottom-heavy sound is created by Daray's wall of percussion, a style with some similarities to what is heard on "The Beast" by his "other" band. Those punishing beats and chunky riffing provide a sturdy foundation for the majestic keyboard melodies. Orion's vocals are delivered in a low-register quasi-Swedish style, largely indecipherable mainly because of a middle-to-back of the mix application. This is not necessarily a bad thing, as the venomous words are simply subsumed into the song structures, rather than acting as a point of emphasis. Working more as a strand in the musical fabric, the upside is the hurricane-force strength of the event. The rayless, yet rich, mood created results in an album that one should consume whole, not piece by piece. Songs are woven together by brief keyboard pieces, the end product a holistic experience. Keep listening, as the album slow but surely envelops you. 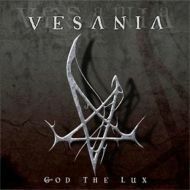 "God the Lux" is not a disc that raises the bar for symphonic black/death metal, but it's not generic imitation either. Influences notwithstanding, VESANIA has created an album that fuses that distinctive Polish death metal power with symphonic black metal elegance.